Description - Life Floor Slate Tiles are the perfect solution for providing flooring around pools, on decks, and patios where water may be present. These tiles, unlike other pool and deck flooring solutions, are crafted from both foam and rubber which not only gives you a soft floor, but one that is also very slip resistant. On top of these outdoor tiles being soft and slip resistant, they are also cool to the touch in direct sunlight and will keep their color in direct sunlight for the life of the product. The tiles are also anti-fungal and anti-bacterial making them perfect for locker rooms, bathrooms, showers, and many other areas where a safe flooring surface is needed. These tiles can be easily installed with the use of contact cement, double-sided tape or a polyurethane adhesive and can be installed underwater. With 7 different colors to choose from and a 5 year warranty, your pool, deck or patio floor are sure to be the talk of the neighborhood. Material – Life Floor foam tiles are made with patented EvaTrax technology which is a non-toxic, UV-stable foam-rubber. Weight – Each mat weighs approximately 1.34 Lbs. Recommended Uses – Life Floor Slate outdoor foam tiles have been designed to be a premium worry-free solution for barefoot traffic on wet surfaces. 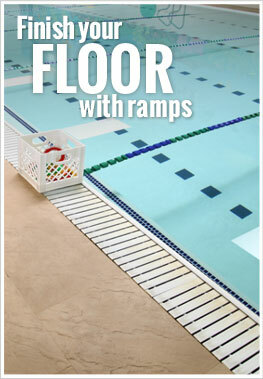 These tiles are perfect for outdoor pools, decks, patios, in showers, bathrooms, locker rooms, saunas, underwater in pools, playrooms, games rooms, and many other areas where a safe, non-toxic, slip-resistant floor is desired. Life Floor tiles are simple to clean and maintain. These foam floor tiles are constructed of durable closed cell foam which means liquids cannot penetrate the surface of the foam rubber mats. If the foam rubber tiles do get something spilled on them or appear dirty, all that is required to clean them is to do a quick wipe of the floor tiles with a damp cloth and your Life Floor tiles will look like new. If a large area becomes dirty, pressure washing the tiles may be neccesary. If you do pressure wash these outdoor tiles, make sure that you use a 20 degree or wider tip and keep the water at least 12 inches away at no more than 1500 psi to prevent damage to the tiles. Measure the installation area to ensure you have enough tiles to cover the desired area. Without applying any adhesive, lay the tiles out as you would want them to lay in the room without cutting any pieces. Ideally, start from the center of the room where you have marked the 'X'. Once you have completed the entire layout without adhesive, begin the adhesion process in the center of the room. Using a general paintbrush, evenly apply contact cement on the back of the tile and to the substrate where the tile will fit. Let both the back of the tile and the substrate area cure for approximately 5 minutes until the contact cement is tacky. Begin by laying down the tile one edge at a time. For all tiles after the first, align the edges tightly to the surrounding tile edges. Ensure each corner and edge are secure by applying pressure with the thumb and index finger. Using a general roller, apply pressure to the entire tile to secure the tile to the substrate. Tiles on the outer perimeter of the room may need to be cut to fit the space. Measure and cut accurately to ensure proper fit. If tile is installed in a wet area with drains, cut area over the drain to ensure proper drainage. In addition, you may drill holes in the tiles to allow water to drain through the tile. Proven to virtually eliminate slip-and-fall injuries. Now with a textured surface for more slip resistance. Designed to be used as flooring for pools, decks, patios, showers, bathrooms, and much more. Color-fast and stays cool in direct sunlight. Non-toxic and can be used in extreme hot and cold. UV-stable, anti-microbial, and mold/mildew resistant. Can these be used on pool steps where they will be underwater 100% of the time? Our 3/8" Life Floor Slate Tiles can be used as pool steps underwater 100% of the time. The tiles are commonly used as pool surfacing do their slip resistant properties. Could this be used around an in ground pool outside in full sun and will pool chemicals harm this product? We now have nature stone and would like to take this out and replace with something better. Our 3/8" Life Floor Slate Tiles were made just for this type of application. These tiles are a perfect alternative to natural stone around a pool and are resistant to pool chemicals. These tiles are also more slip resistant when wet compared to natural stone or concrete, and the lighter colors are cooler in direct sunlight compared to those products as well. These tiles have been installed in pools both residentially and commercially all over the world. I have a lung disease. Do these floor mats have an odor to them? Can they be put down with just the interlocking? I want to put them on my small glassed in porch over tile flooring that is very cold. If they smell like rubber tiles, I cannot physically tolerate them. Our 3/8" Life Floor Slate Tiles do have an odor to them. To people who are sensitive to smells, these tiles may not be the best product for them. We do have products that have little to no odors to them. They are made of virgin rubber. These products our are Virgin Rubber Tiles, 1/4" Terra Lock Virgin Rubber Tiles and our 3/8" Textured Virgin Rubber Tiles. Can this product be used outdoors? Specifically under a deck. 3/8" Life Floor Slate Tiles are made for outdoor use especially in areas where lots of water will be present. They will work great under a deck. Would these tiles withstand all outdoor elements--including snow -- without damage? Our 3/8" Life Floor Slate Tiles can withstand all of the elements. These tiles are non-porous and are slip resistant when wet. They are very easy to clean and maintain. If snow were to pile on top of these tiles, we recommend not using a shovel or snowblower. We've had this product on our indoor pool deck for about 1 month and it has been received extremely well by the public. The number of slips, trips and falls has greatly been reduced! Great product and looks great!